Increasingly more smart technology is being put into cars. Artificial intelligence can react more quickly than people, and it is also being introduced into tyres. Consumers are particularly interested in tires that can adapt to different weather conditions by utilising sensor technology. According to a survey commissioned by Nokian Tyres, 34% of European drivers hope that the black and round rubber parts on their cars will also automatically react to the weather in the future. The Internet of Things is rapidly making headway into most consumer products. In practice, this means that objects are equipped with sensors that can measure, identify, and react to changes in the environment. A bed with sensors can monitor your quality of sleep, and smart clothing can cool down or warm up its users when necessary. A smart tyre could also monitor both itself and its surroundings faster and in more ways than the driver. Sensors in the tyre could measure the tread depth and wear and alert the driver when new tyres are needed or ask them to rotate them from front to back in order to even out the wear and optimise their service life, said Teemu Soini who is responsible for new technologies at Nokian Tyres. In the first wave of smart technology, sensors installed in tyres will measure different variables and forward the information to the driver, either directly into the vehicle’s onboard systems or to the driver’s mobile device. However, a true smart tyre is one that can automatically react to the information from the sensor – without any driver interference. 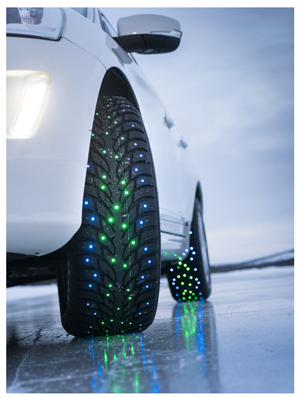 These tyres could automatically adapt to weather and road conditions by changing the tread pattern, for example. In wet weather, the grooves storing water could increase in volume and reduce the risk of aquaplaning. The tyre industry has already taken the first steps towards smart tyres, and sensors are already commonly used for measuring inflation pressure. Real smart tyres are not available yet, however. Currently, there are very few next-generation smart applications for passenger car tyres, but this will surely change within the next five years, and premium tyres will provide more driver assistance solutions. Tyres that react automatically are still a thing of the future, Soini estimated. For this to become a reality, we need to solve a number of things, such as how to make the sensors durable and safe enough during the continuous stress that they are subjected to, and how to make smart technology a natural part of the massive tyre production process. Alongside smart tyres, consumers want safe tyres. According to Nokian Tyres’ survey, nearly every second driver would make tyres safer than they are now. Tyres are an essential safety factor. Four palm-sized pads are the only contact point with the road surface, and their main task is to safely take you where you are going, regardless of the weather or road conditions. Today’s high-quality tyres are already extremely safe. Nevertheless, there is always room for improvement. Continuous development and relentless testing are key. Developments in tyre material technology enable us to build tyres that work even better under the most challenging conditions. In practice, we can improve grip at the extremes without sacrificing durability. At Nokian Tyres, safety has always come first when developing new tyres and it will continue to be that way, Soini said. What is required to extend the life of your tires? Does winter driving make you anxious?